You owe it to yourself to make sound, life and financial choices. Update: I made some changes in the post below, reflecting some of the information that was not written previously and made existing information clearer. As of 2/7/16. Good news for us in NS! Other than putting the allowance into other savings accounts that offer meagre interest rates, we have this option now! An option to save for the 2 years or 22 months of service. 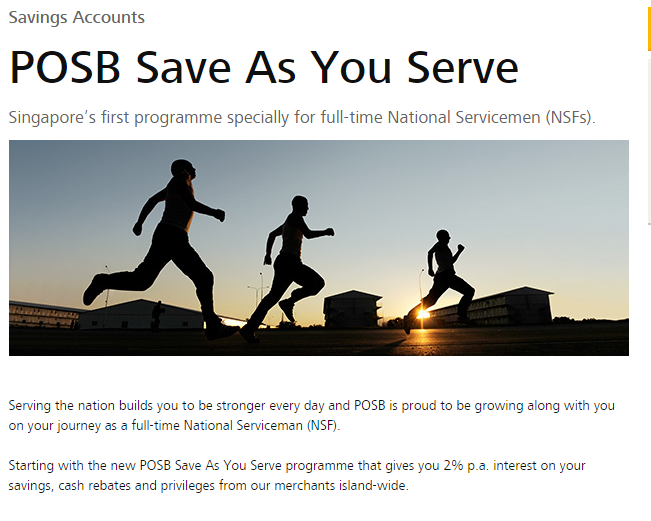 Introducing the POSB Save As You Earn (SAYE) account. I was truly excited for this when I got wind of this. Looking deeper, I made some comparison. I thought the CIMB FastSaver might serve as a useful comparison as well. Good for new enlistees who just wants to save a fixed amount every month and not do anything with it until they ORD. It gives fixed deposit rates for small amounts. Note: This works like a 24-month fixed deposit, so you will lose the 2% cash gift interest if you withdraw the sum. So do make sure you are comfortable with the amount being put in and go with it for the long haul. If you shop often, then you have those rebates so long as you have those cards. There's also... a $30 cash gift! However, do read the Terms&Conditions. More for new enlistees, you will have to decide if you would like the Home-TeamNS-POSB Debit Card or SAFRA DBS Debit. Those cards come with membership fees. Of course, if you are already intending to get either one, then this cash gift is a bonus. Existing SAFRA/HomeTeamNS card members do get the $30 cash gift too! You don't have to "lock" the savings up and already get 1% from the get-go. There is a minimum initial deposit of $1000 to open the account. You also need to have a balance of $1000 in order to have interest paid, though. There are no ATM cards and no cash rebates for this account. You might also derail from your savings goal and feel the urge to spend since it is convenient to transfer between banks. Assuming the cash gift interest of 2% and not including the standard interest rates which can be accessed here. POSB SAYE offers around $5 more. For the fresh enlistees, this will make perfect sense. If I am a fresh enlistee, I will sign up for POSB SAYE definitely. I can lock it up and forget about it until 2 years later. Probably transfer extra savings to POSB so that I can increase the monthly contribution. Don't transfer emergency funds to SAYE too, if you find yourself needing the cash, you are going to waste the effort. For existing enlistees, probably not worth it since time is not on our side. I have around 15 months of service left. Let's say I am to open a FastSaver SAYE account now, assuming $100 monthly contribution, at the end of 15 months, the interest will be $2.50 more. I would prefer to just keep it in FastSaver throughout and save the trouble since the 2% cash gift will not be applicable after ORD. With that said, I think the decision will lie on whether you want the HomeTeamNS or SAFRA cards if you don't have either one yet. The $30 cash gift, in a way, can then subsidise the costs. Fellow and future servicemen, please do your OWN homework for this! It's your hard-earned allowance! It has been a little over 2 years ago that I started reading into stocks and bought a few stocks. As a university student now, I lack the financial capital as before and priorities are now different. As such, I don't find myself trying to read as much as before, but I'm glad the habit of reading the posts on thefinance.sg has stuck with me. Meet Kinokuniya and Books Depository. The former has physical brick-and-mortar and online stores while the latter is solely an online retailer. For all the book lovers out there, I am sure these are some of the places we go in order to satisfy our book cravings. Kinokuniya was where I picked up my first book on investing. I summarised some of my thoughts on that book here. Since then, I have bought at least 6 other books on investment and other genres that cost at least $200 in total from Kinokuniya. Book lovers should also know that Kinokuniya is not the cheapest for pricing. I came to know Books Depository recently, and boy is there a huge difference in price. Let's compare an investment book, say Common Stocks and Uncommon Profits and Other Writings. Check your Eligibility for GST Voucher 2016!